Space Bears Sunlit Pulsar is part of the Sycha Slings Studio range. It is 100% Egyptian cotton, 290 GSM and 65cm wide. 5% of the price of Space Bears Sunlit Pulsar wraps and ring slings will be donated to Cancer Research UK. 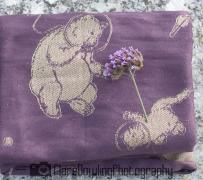 Space Bears Starlit Pulsar is part of the Sycha Slings Studio range. It is 100% Egyptian cotton, 290 GSM and 65cm wide. 5% of the price of Space Bears Starlit Pulsar wraps and ring slings will be donated to PANDAS. Sycha Slings is a UK based woven wrap company, launched in 2016 with the aim of enabling as many people as possible to experience the closeness of babywearing for themselves. We have two different ranges of woven wraps with prices starting from £64 including UK postage, and donate 5% of the sales price of the wraps and ring slings to charity (more details here). 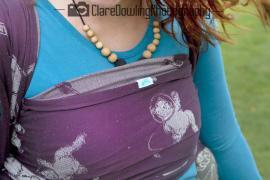 Sycha Slings is also a member of the Baby Carrier Industry Alliance.